I've never played anything from the New World of Darkness from White Wolf, but back in the day I did have a few Werewolf books and I did try to play their CCG. Now that I think of it I also read a few of their novels. I remember really liking them. 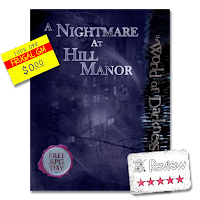 As part of a Halloween promotion I was able to download A Nightmare at Hill Manor from DriveThruRPG. It is still available as a free PDF. This 66 page PDF contains just about everything you need for a one-off of this game. Grab a bunch of d10's, some pencils, and you should be set. I was really surprised at just how much information about the system itself was in this download. 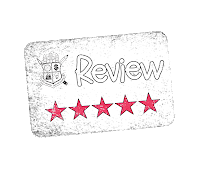 The first half of the book is nothing but explaining the basic game mechanics and the additional information needed for players to understand what their PCs could do. It seems to fall just short of being able to create "full" PCs, but there are pre-gens and enough guidance for some quick-start PC creation, so the full instructions aren't needed. The adventure is somewhat free-form, which means the GM really needs to read all of the material thoroughly. With a story-teller system you'd want to be intimate with the background anyway. I have only two minor qualms about this download, and I think at least one of them is just my personal preference. The first is the setup of the PCs into the game. There is nothing wrong whatsoever with the way the PCs are introduced, it is just that there is a small write-up of each PC that goes with each character sheet, but since the PCs are supposed to know each other quite well it would make sense to have at least a one-page overview of the other PCs from each PC's perspective. I've seen this done at D&D tournaments and it gives the player some background they should know about each other instead of having to figure things out unnecessarily. "World of Darkness" for otherwise uninitiated PCs. I think with a little careful tweaking of the player handout materials for players this introduction to the game could come from a "straight" source. Get a group of willing players to start what appears to be a modern game and have them get introduced to the supernatural elements along with their players. If the introductory materials for this game didn't have "World of Darkness", skulls, and other clues scattered throughout this adventure could make for a much more interesting one-off that ends up leading to a new campaign. Overall I really liked this download because it was a lot more than I had expected. If I had gotten this in late September or early October I would have considered running it as a holiday one-off for my group.